Mr. Imes first heard about Mrs. Lemley from his neighbor who told him how she was voluntarily making making hundreds of dresses and pants for children around the world, but needed help. Mr. Imes knew about the BHS Interact Club through his daughter, who is a member, and reached out to club sponsor, Haley Nickolaou. Mrs. Lemley got her start making pants (or “britches” as she lovingly call them) out of T-shirts and dresses out of pillow cases about a year and a half ago and donates them to local churches with connections in various countries. “I don’t sleep at night, so sewing really helps me,” explained Mrs. Lemley who has made about 900 garments since starting this project 18 months ago. 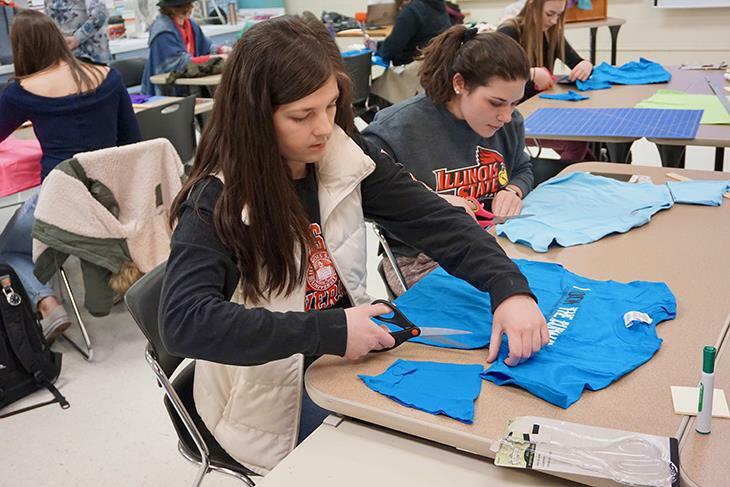 To help Mrs. Lemley get even more garments into the hands of children in need, Interact Club Members are busy cutting the 200-plus collected T-shirts during club meetings to get them ready for Mrs. Lemley to sew and ship. So far students have cut 45 shirts with three more workshops in place to continue the prep process.